Every year National Public Works Week gets bigger and better. The number of participating municipalities continues to grow, which means the number of citizens who are exposed to the value of public works grows. At APWA one of our main goals is to educate the general public about the value and necessities of public works projects throughout North America, and public works professionals like you are our best ambassadors. For resources on how to plan your own event, including a planning calendar, and sample events check out APWA National's Public Works Week "How-to Guide"
2019 NPWW Posters NOW AVAILABLE! 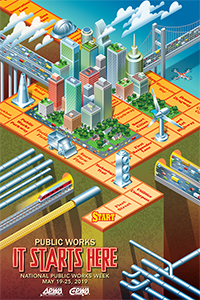 2019 National Public Works Week (NPWW) Posters are now available from National! Don't wait, as they sell out every year. Use it to help promote public works as a profession and to energize and educate the public on the importance of public works to their daily lives. APWA is proud to announce “It Starts Here” as the theme for the 2019 National Public Works Week. This theme represents the many facets of modern civilization that grow out of the efforts put forth by the public works professionals across North America. The bottom line is that citizens' quality of life starts with public works. Check out the 2019 National Public Works Week website for additional information, links, resources, and downloadables to help make your 2019 NPWW event a memorable one!